I'm blond with fine, dry hair so finding a conditioner that is moisturising enough to give me some shine without a greasy residue, but light enough to retain bounce is a constant quest. Hair masks once a week do help, but I'm constantly on the look out for a leave in conditioner that would help daily. 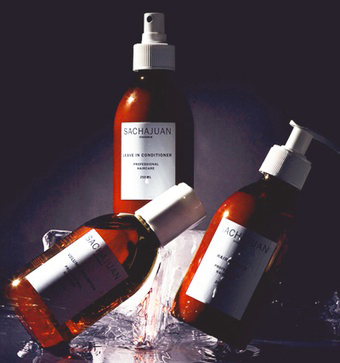 When one of our experts recommended we check out a Swedish haircare range called Sachajuan my interest was immediately piqued, as the Scandinavians tend to have finer hair. The hook with this brand is something they call Ocean Silk technology, which basically means they extract proteins and minerals from the following sea algae - Enteromorpha Compressa, Himanthalia Elongata, Rhodophycea and Chondrus Crispus. The products are all made using over 50% natural ingredients and the effects are instant. It was the Leave in Conditioner that sold me on the Sachajuan range, it has a slightly annoying pump spray design but one you get on your hair this stuff is pure bliss. Spray it onto towel-dried hair and then either style or leave to dry naturally, it adds an addictive softness and lightness without any notion you have product in your hair. This conditioner also works well on thicker hair, but there are many brilliant conditioners out there that do that.